We all know that the majority of the copy we write for the web goes unread and unappreciated. To some extent that’s our own fault – it’s bad, boring or it’s in the wrong place. People read quickly, and most know right away if they are interested – so what can you do to make your copy more interesting? I have collected some thoughts from a few articles I just read that should shed some light on the importance of a good headline. 4. Do all of the above in an ULTRA-SPECIFIC way. 1. Reach and influence, at the lowest logical cost, the most people who can and will respond. 2. In this Age of Skepticism, cleverness for the sake of cleverness may well be a liability rather than an asset. 4. Tell the reader/viewer/listener what to do. In short, your headlines need to tell the reader why they should continue reading, and this can be done with a number of techniques. If you can’t convey interest, you may want to reconsider writing anything at all. Delicious food at a reasonable price, but eat at your own risk! I recommend the fries and some antacids! I good old-fashioned feel-good movie. It was fun to watch, although a little too much language for a young family. The story is inspiring, thoughtful and engaging and I enjoyed it. A favorite of my family’s, Del Taco is home to the Taco Tuesday deal that gives 3 beef soft tacos for $1! Panda Express has always been a favorite of mine. I love the orange chicken and the Beijing beef with half rice, half noodle. I also appreciate the way the owners run the business. I couldn’t help but chuckle when I pulled this page up from a website I was working on. 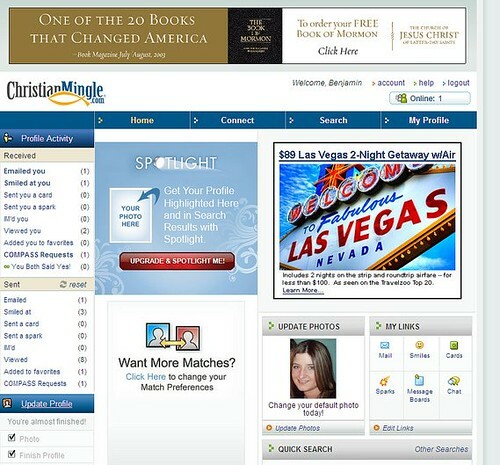 I was suprised to see that the Church is advertising with general market banner ads. I wonder which of the two ads on the page is getting a better click-through rate? The book explores the seemingly small factors that can create epidemics both good and bad. It was interesting to be run through several examples of things that changed because of factors that we would often overlook. I recommend it on audio book, played double speed. There’s a good synopsis of the book at Notes of Intelligence. A great buffet with delicious soups, salads and breads. I’d give it more stars if only it had any meat! A fancy burger joint that has gone out of its way to look like a fast food joint. It’s clean, tasty and fun, but it’s also loud and probably too expensive for burgers and fries.